Today, we're covering the difference between new and remanufactured centrifuges. You can view how a remanufactured centrifuge is different from a used centrifuge here. Remanufacturing is a process where every component of a machine is taken apart and inspected. If any component fails to meet our standard, which is equivalent to the OEM standard, that component is replaced or repaired. The functionality, quality, and warranty of a remanufactured centrifugal separator are equal to that of an OEM machine. The biggest differentiators are price, process, delivery time, and service. Investing in a remanufactured centrifuge requires less capital than a new OEM centrifuge. While centrifuges vary widely in price, remanufactured centrifuges cost approximately 30 percent less than a new centrifuge straight from the OEM. Remanufacturing begins with the disassembly of the centrifuge. During disassembly, all parts are cleaned, repaired, and/or replaced. Then, they are reassembled into a remanufactured centrifuge which functions in excellent working condition. Remanufacturing makes it easier for facilities to upgrade their current equipment without disrupting their current infrastructure or replacing their existing baseplate. Another differentiator between new and remanufactured centrifuges is the wait time between when the machine is requested and when it arrives at your facility. When we have the machine in stock, wait time on a remanufactured centrifuge is typically 6-10 weeks. By comparison, you’ll usually wait 30 weeks to one year for a new OEM machine. 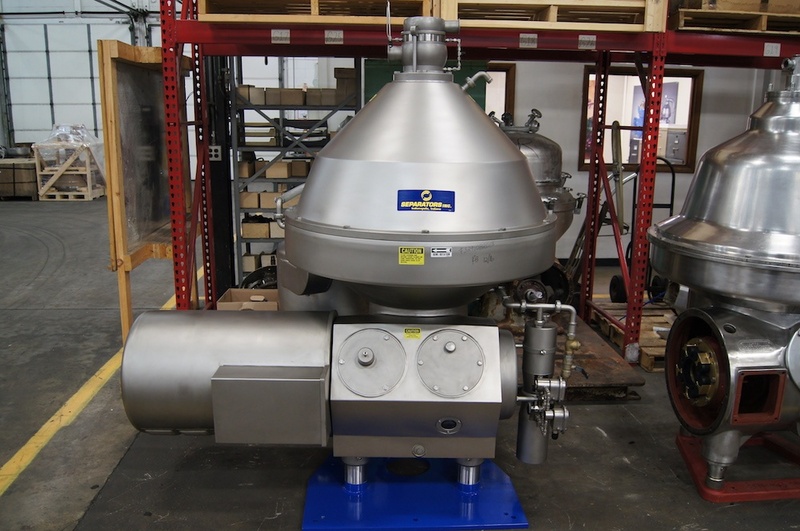 We maintain an extensive inventory of centrifugal separators that are ready for remanufacturing. Regardless of your industry, it's likely that we already have the right machine for your process and facility in-stock. Alternatively, we have had great results sourcing specific machines for our past customers. Unlike OEM manufacturers, we do not lock our customers into service contracts. We do ask that our customers indicate their interest in having their machines serviced and maintained by our technicians, but it's a nonbinding agreement. We do this so we can plan accordingly and know when we need to expand our team of service technicians. We offer nonbinding service agreements because we want our customers to have access to the highest quality of service, whether or not it's with us. We pride ourselves on our dedication to customer service. We take service calls 24/7, we respond quickly to questions or requests, and we schedule plant visits according to what works for the customer. When you invest in a remanufactured centrifuge, you're obtaining a piece of equipment with the ability and functionality of a new machine, and you're saving your facility time, money, and resources.